Extrusion dies can be made to form a virtually limitless array of shapes and sizes. The die itself is a steel disk (normally H13) with an opening, the size and shape of the intended cross-section of the final extruded product, cut through it. An extrusion die, and associated tooling, in the press. Dies are broadly grouped as solid (or flat) dies, which produce solid shapes, and hollow dies,which produce hollow or semihollow shapes. Combinations of solid, semihollow, and/or hollow shapes may be incorporated into a single die. A solid die may have one or more orifices or apertures through which the softened alloy is forced (extruded). Multiple apertures in a single die produce multiple extrusions with each stroke of the press. A solid die, as shown here, produces shapes without any enclosed voids and/or semihollow conditions. A semihollow die extrudes a shape that is nearly hollow, partially enclosing a void, the area of which (the area of the die tongue) is large in comparison with the gap where the tongue is connected to the main body of the die. Hollow dies take a variety of forms. Bridge, porthole, and spider dies, for example, include a fixed stub mandrel as an integral part of the die. Each type of hollow extrusion die serves certain functions and carries its own advantages and disadvantages. The manufacturing methods and costs vary widely. The choice of design, and even manufacturing methods, will depend on the profile, press and container size, and production requirements. A hollow die produces shapes with one or more enclosed voids. The most common types of hollow dies are the porthole and pancake. They typically are the most cost effective and easiest to manufacture, allowing the designer to be much more creative in the placement and shaping of the ports and feed. They are also the easiest for CNC Machining, which allows the die maker and die corrector to quantify any alterations for production improvements on future dies. Die Costs: Initial costs (and lead-time) of aluminum extrusion tooling is usually a good deal lower than the tooling required for alternative technologies like die casting, steel roll forming, vinyl extrusion, impact extrusion, stamping or pultrusion. Click here for representative cost and lead time comparisons. A typical extrusion operation will make use of a die assembly, including the die itself, which, together with a backer, is enclosed within a die ring, placed in front of a bolster, with a sub-bolster behind, all held together as a unit by a tool carrier. The backer, bolster, and sub-bolster provide the necessary support for the die during the extrusion process. Depending on the complexity of the extruded shape, the total cost of the extrusion tooling may include charges for these supplemental tools. The best combination of product performance, quality and cost is achieved when the product designer, the die maker, the extruder, and the purchaser recognize each other's requirements and work together. 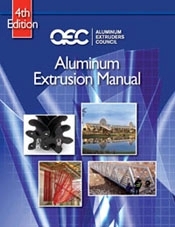 Additional information regarding dies and tooling may be found in AEC's Aluminum Extrusion Manual.